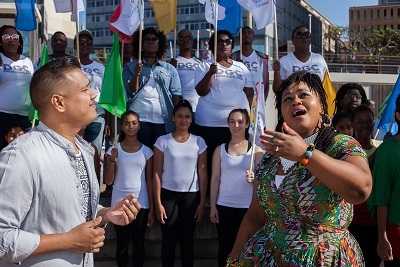 Two Durban performers, Justin Nanak and Thandeka Dube-Ndhlovu, have composed an original praise-and-workshop ballad, The Mighty One, which was specially written for the Mini World Youth Day 2017 taking place in Durban from December 6 to 10, 2017, and has been adopted as the festival’s official theme song. The song and accompanying music video was launched to stakeholders at a Mini World Youth Day Presidium Meeting on July 24, 2017, in Durban, and can now be viewed online. These long-time friends have relished this opportunity to express their spiritual devotion through music and are delighted that their song has been formally adopted as the Mini World Youth Day theme for 2017: "My prayer is that this song of praise will help our young people reach a higher level of worship as we unite and deepen our spiritual connection with the amazing God we serve!” said Justin Nanak. Co-writer Thandeka Dube-Ndhlovu adds: “Everyone can relate to the theme as the Lord has surely great things for all of us." The duo teamed up with Durban creative Karen Van Pletsen of Raise Your Voice, who arranged and produced the track which was recorded at Sonic Studios in Durban and features carefully hand-picked top Durban talent: the Durban Gospel Choir; Khethelo Zungu (guitar); Jude Kenrick (drums) and Nina Sudgen Watson (cello). The track débuted on July 24 accompanied by a world-class music video produced by Raise Your Voice, filmed by Jimmy Reynolds and edited by Mark Edwards ,which features the Archbishop of Durban, Cardinal Wilfrid Napier OFM as well as an array of talent drawn from parishes across the city including the inspiring Kwa Thintwa Signing Choir, from the Kwa Thintwa School for the Deaf which was founded by Archbishop Hurley; Katherine Anderson from Blessed Sacrament; Andrea Govender from Immaculate Conception, and groups from Saint Frances Xavier; Saint Josephs; Blessed Sacrament and Star of The Sea led by Kendall King, Lezariah Blignaut , Carina Teixiera respectively. The core theme for the event is drawn from Mary’s Magnificat and more specifically Luke 1:49 which says “The Mighty One has done great things for me, and holy is His Name”. The former was the inspiration for Nanak and Dube-Ndhlovu’s composition. The intention is for the five day formal gathering to bring together young people between the ages of 18 and 35 years from South Africa, Botswana, Lesotho and Swaziland. Young people from all walks of life, representing different cultures, different languages and different geographical locations will come together to deepen their faith and to be encouraged to become more active, thoughtful, engaging and caring global citizens. Over the five days, there will be community engagement; prayerful activities; discussion groups and pilgrimages. Mini World Youth Day forms part of global build-up to World Youth Day, which will be held in Panama in 2019. First established in 1985, World Youth Day takes place every three years with Mini World Youth Day events hosted in cities around the world forming stepping stones towards the major event in any one particular host country. Booking for the conference is now open, and booking is encouraged as delegate numbers are limited, and booking closes on August 31. All information and booking details can be found on the conference website: https://miniworldyouthday.co.za/. Included in the registration fee charged will be accommodation and catering. The conference is open to Catholic youth between the ages of 18 and 35 years.